Quilting Adventures: More Civil War stuff .....! A while back I had blogged about a quilt I had made out of the book The Civil War Sewing Circle by Kathleen Tracy (post may be viewed here). I find her new book so inspiring! There are so many projects I could make out of that book! Anyway...... I completed another quilt! Given that I'm visual, I need to see the fabrics in order for me to use them. What that does is only create a messy sewing room! lol Seems I'm continuously cleaning fabric off my cutting table! sigh! Yes scraps multiplies in their boxes. Think they do not like to lay in the dark :) Beutiful quilt. Gorgeous quilt, Carole. The colors are amazing. I donated 'most' of my scraps to my quilting group before we moved...those that had been hanging around forever. I just couldn't justify adding another box to the mountains that were already packed and stacked. Has spring arrived in your neck of the woods yet? We seem to get teased with a couple of nice days and then it gets cold again. That's an adorable quilt Carole! I feel your scrap pain -- I have a mess in my sewing room too! Wow, I really like this one. Thanks for sharing. My scraps do seem to multiply, but I love working with them. I have been thinking about making that quilt. I love how yours looks .... it is so colorful. What a pretty quilt! That would make a nice QOV pattern. I love that piece, beautiful fabrics and colors. I need to get in my sewing room and start doing some cutting for my hexagons. I got a larger box to put them in, so I will have it all together to work on. oh aren't we lucky to have scraps! I love scrappy quilts so never complain about them!!!! Oh my I love your new scrappy quilt. I have her first book but not this one. Absolutely the scraps keep building in my room too. 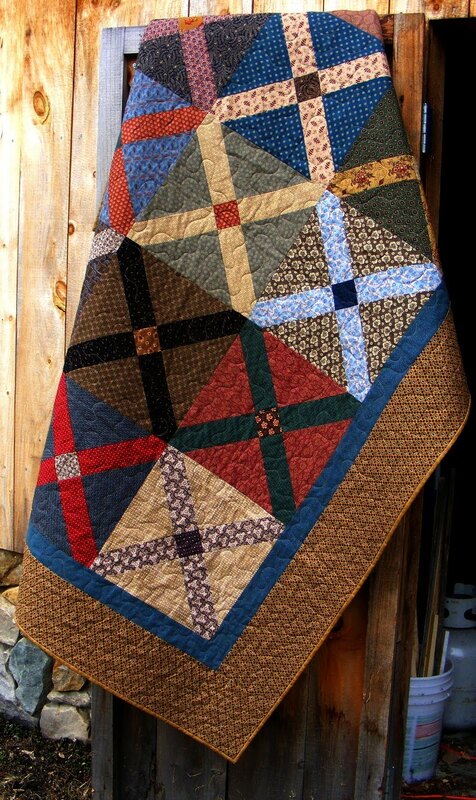 I love the fabrics in this quilt. I think blue and brown mix so well together. Oh man, I love this one as well! I still need to get her book.